It can sometimes feel like an irresistible choice when confronted with a gorgeous glass dining table or coffee table. But until you weigh up the pros and cons of glass furniture, how do you know if that gorgeous glass table is really for you and your home or not? The important thing to remember is there are three different types of glass used for furniture. The glass can either just be regular glass (quite fragile, not recommended for heavy usage), annealed or tempered (the most durable of the three). There are many visual benefits of glass furniture. Glass furniture often oozes a high level of elegance and sophistication – and looks great in modern and contemporary homes. Glass also has a unique ability in that it is able to enhance the look of other materials that accompany the glass furniture, such as wood or marble. Glass also gives the illusion of space, as its transparency doesn’t block the views behind it, creating more visual “empty space” as it helps with the distribution of light. The major downside to glass furniture is, of course, keeping it clean. Glass furniture is prone to finger prints and smudges that can easily throw off the otherwise pristine look. Glass can be considered to be quite a high maintenance material for furniture (not so much in comparison to marble furniture though…. ), to keep it in beautiful condition. You will want to regularly wipe it down with a soft, clean sponge and warm, soapy water. You may even want to use a little baking soda dissolved in warm water to ensure that the glass stays sparkling. Due to glass’ fragility, you also have to make an effort to ensure that nothing scratches or chips your furniture, as it can be near impossible to fix deep scratches and chips in glass furniture. This may also mean that you will have to start using coasters and place mats if you don’t already. You also need to be careful not to drop heavy objects onto glass tables for obvious reasons. If you have young children in the house, this can be a real concern as children will naturally be less mindful of the glass furniture and it could be hazardous to them if the glass were to break. Price is also an obvious issue. Glass furniture isn’t known to be cheap, especially if you sensibly opt for high quality furniture made from tempered glass which is thermally and chemically strengthened to reduce breakage. You need to consider the people in your household and whether they will appreciate it and be careful not to damage it, the surrounding furniture and decor (how much glass is too much glass?) and obviously budget. If you can’t afford a decent quality glass furniture, it may just be a waste of money if it breaks or chips quickly. And don’t just get an item of glass furniture because you think that it looks pretty on its own. If it doesn’t enhance the room that it’s in in anyway, or if it contrasts too much with the existing style of the room, it’s not worth it. 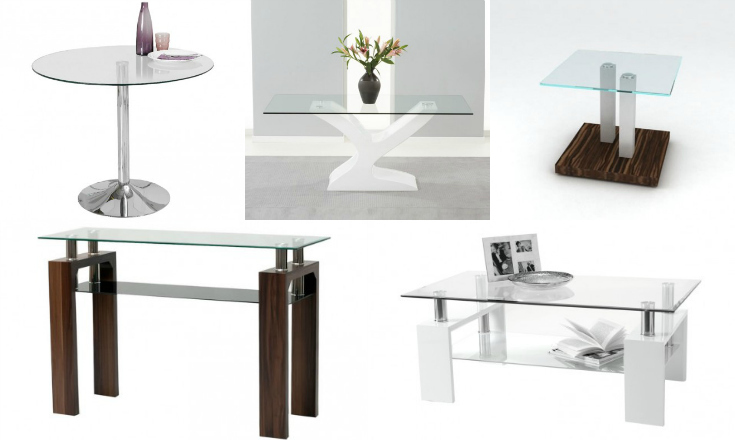 Having weighed up the pros and cons of glass furniture, if you’ve decided that it’s for you, please browse through our collections of glass console tables, glass kitchen tables, glass lamp tables, glass coffee tables, and glass dining tables!